Jen-Hsun Huang, CEO of Nvidia, will unofficially kick off CES in Las Vegas, a sign that the consumer-electronics spotlight has shifted from computers and smartphones to the technology of self-driving cars and devices you can talk to. For most of its 23 years, Nvidia was best known for building graphics processors that helped computers display high-powered computer games. Now, rising interest in the hardware that powers self-driving cars, artificial intelligence and virtual reality has taken the Santa Clara, Calif., chipmaker, little known outside the high-tech industry, to new heights. On Wednesday evening, Nvidia will unofficially kick off CES in Las Vegas, occupying a speaking slot held in past years by the likes of Microsoft and Intel. When: News conferences Jan. 3 and 4, show floor open Jan. 5 to 8. The mammoth technology industry confab, formerly the International Consumer Electronics Show, used to be centered on big-screen televisions, appliances and speakers. Those devices are still featured at the show. But these days the hype, and much of the conference-hall space on the Las Vegas Strip, focuses on technology that enables cars to drive themselves or allows you to talk to your devices. Nvidia processors help power some of those futuristic applications. Nvidia’s stock price soared nearly 230 percent in 2016, and the firm took in $1.2 billion in net income during its most recently reported 12 months, double the total of the previous period. Nvidia’s place in the keynote slot the evening before the opening of the CES show floor marks a changing of the guard at the event. That position for years was held by Bill Gates, and, later, Steve Ballmer, during Microsoft’s personal-computer heyday. When Microsoft bowed out after 2012, chipmakers Qualcomm and Intel, dominant in smartphone and PC processors, respectively, held that slot. In Nvidia, the show, put on by the Consumer Technology Association industry group, is homing in on a new wave of technologies untethered from the smartphone or PC. The company’s CEO, and the man who will take the microphone on Wednesday, is Jen-Hsun Huang. The 53-year-old was born in Taiwan and emigrated to the U.S. as a child, attending Aloha High School west of Portland, Ore., and earning a degree in electrical engineering from Oregon State University. A master’s degree at Stanford followed. In 1993, Huang and two veterans of Sun Microsystems founded Nvidia. The company is a resident of the semiconductor industry, the catchall name for builders of brainlike circuits that control the flow of electrical signals in computing devices ranging from laptops to smartphones. The most widely known name in that world is Intel, which makes most of the processors that power personal computers and servers in cloud-computing data centers. Intel focuses on central processing units, the general-purpose chips proficient in completing a wide range of tasks and quickly switching from one to the next. Nvidia, based a short drive from Intel’s headquarters, also in Santa Clara, is the inventor of the modern graphics-processing unit. Those chips aren’t as flexible in their applications as CPUs, but can complete many simple operations quickly and simultaneously. The original use for that kind of horsepower was video gaming. Computer games in the early 2000s went from pixelated, two-dimensional, tabletop-like experiences to three-dimensional worlds. To display that often required components dedicated to graphics, and Nvidia’s GeForce line of graphics cards is the industry standard. Sales of gaming-focused GPUs account for more than 60 percent of Nvidia’s revenue. Nvidia’s current hot streak comes as the company tries to expand the pie beyond its gaming wheelhouse. The technology universe seems poised to grant that wish. The focus at CES, the weeklong trade show attended annually by more than 150,000 technologists, marketers and journalists, in recent years has focused on tools that bring new ways to interact with humans or otherwise mimic human intelligence. Amazon.com’s Alexa voice-activated assistant relies on a trove of human speech data and pattern-recognition software to make sense of spoken commands. Self-driving cars similarly are designed to bring to bear the experience of thousands of other vehicles to inform how they react to situations on the road. Using GPUs, it turns out, can speed up those sorts of tasks. 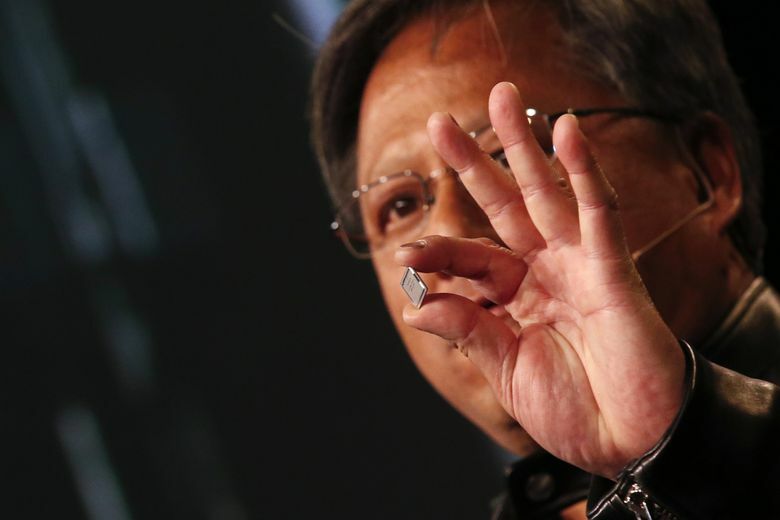 Nvidia’s Tesla line of chips targets the builders of the data centers that power artificial-intelligence applications. The company is also marketing a package that executives say is the only off-the-shelf hardware and software platform for builders of self-driving cars available today. Jeff Herbst, a vice president of business development at Nvidia, says the company a decade ago couldn’t have predicted that its future would lie in areas like artificial intelligence. Information in this article, originally published January 1, was corrected January 2. A previous version of this story incorrectly stated that Nvidia was 33 years old.